Leamington suffered a sickening defeat to kick off 2017, with Banbury scoring the only goal of the game with just 12 seconds of second-half injury time remaining, writes Paul Okey. It was a scruffy goal to match much of what preceded it, with substitute Mark Bell’s close-range effort squirming under the body of Tony Breeden and trickling over the line to complete a miserable festive period for the visitors. Banbury manager Mike Ford had launched an outspoken attack on Brakes’ style of play in the build-up to the game but it was the home side who were reliant on long balls in the opening skirmishes. In contrast, the visitors’ first sight of goal came from a neat piece of play from Ahmed Obeng, who flicked the ball on for a first-time shot from Richard Gregory which cannoned off Puritans keeper Jack Harding and was put behind for a corner. At the other end, Conor McDonagh produced a clever turn to take two defenders out of the game and zipped in a cross which was begging to be converted. However, Martin Asiedu Ofosu was the only attacker to gamble on the delivery and he was unable to make a connection. Just short of the half-hour, Banbury enjoyed the first spell of dominance either side had managed to exert on proceedings. Ahmed Obeng looks to escape the clutches of Marvin Martin. James Mace did well to hold up McDonagh after he looked to have burst clear and Connor Gudger headed out the resultant corner from under his own bar before Breeden made a comfortable claim following some indifferent defending from the second dead-ball delivery. Jack Edwards might have done better after having a free run on to Gudger’s cross, with his header lacking the power to trouble Harding but it was a rare moment of threat from the subdued visitors. Banbury then wasted a gilt-edged chance to open the scoring in the 39th minute. 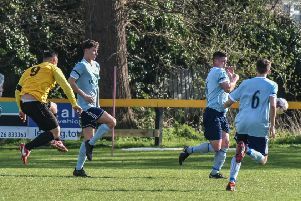 Ofosu produced the initial bit of skill to work his way into the box and Zac McEachran eventually laid the ball across the face of goal for Ofosu who had taken up space on the penalty spot. The on-loan striker completely mishit his shot but it turned into the perfect lay-off for the onrushing Callum White whose goalbound effort was met by a superb sliding block from Gudger. After a tepid first half, the pace of the game improved marginally after the interval with Leamington showing more intent and they were unlucky not to break the deadlock in the 52nd minute. It was a chance all of Courtney Baker-Richardson’s making with the 21-year-old the first to react after challenging Marvin Martin for a high ball and then beating a covering defender before crashing in a left-foot shot against the base of the near post with Harding unmoved. Banbury responded positively as Leamington went back into their shells, with a Marvin Martin shot deflected wide by Richard Taundry and Ofosu fizzing a cross across the face of the six-yard box after linking up cleverly with McDonagh. The lively Ofosu then beat the offside trap but instead of getting in a shot on goal, he put in an extra twist and turn and only succeeded in bamboozling himself, allowing Brakes to clear the danger. A spate of substitutions from both sides only served to disrupt what little flow there was, with two wayward George Nash shots the only efforts of note as the game meandered towards a conclusion. With play entering the final minute of the 90, Brakes had a chance to claim all three points when they were awarded a free-kick from a central position 25 yards from goal. However, Taundry’s strike, despite beating the wall, lacked the power to trouble Harding. It seemed a suitably downbeat end to a forgettable afternoon for the visitors but it was to get much worse in the closing minute of the three added on for stoppages. McEachran worked space on the right to square for the unmarked Bell, who did his best to pass up the opportunity, sidefooting straight at a desperate dive from Breeden before following up to make sure as the ball rolled, almost apologetically, over the line. It was a sorry way to lose any game, with the restart merely prolonging the agony as Brakes’ kick-off was quickly followed by the final whistle and more scenes of celebration from the home faithful. Banbury United: Jack Harding, Jack Westbrook, Andy Gunn, George Nash, Luke Carnell, Callum White (Eddie Odhiambo, 66), Conor McDonagh (Darius Browne, 84), Martin Asiedu Ofosu (Mark Bell, 74), Zac McEachran, Marvin Martin. Subs not used: Sam Humphreys, Jacob Blackstock. BRAKES: Tony Breeden, Richard Taundry, Connor Gudger, Joe Magunda (Ben George, 80), Dan Preston, James Mace, Courtney Baker-Richardson (Rob Thompson-Brown, 61), Callum Gittings, Richard Gregory (Ryan Rowe, 73), Jack Edwards, Ahmed Obeng. Subs not used: Tom James, Nathan Olukanmi.